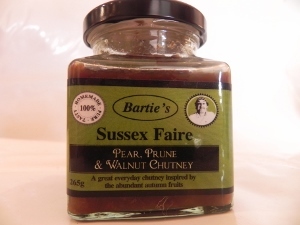 A great everyday chutney inspired by the abundant autumn fruits. Great with milder cheeses such as Brie or un-ripe camembert. Delicately flavoured. Onions, Pears (27%), Cider Vinegar, Prunes (8.2% - contains Potassium Sorbate & Sorbic Acid ), Brown Sugar, Water, Walnuts (4.9%), Ginger.